Fashion Photography series Desbordamiento photographed in 2011 on location at Jardin Botanico Lankester, in the province of Cartago, Costa Rica. 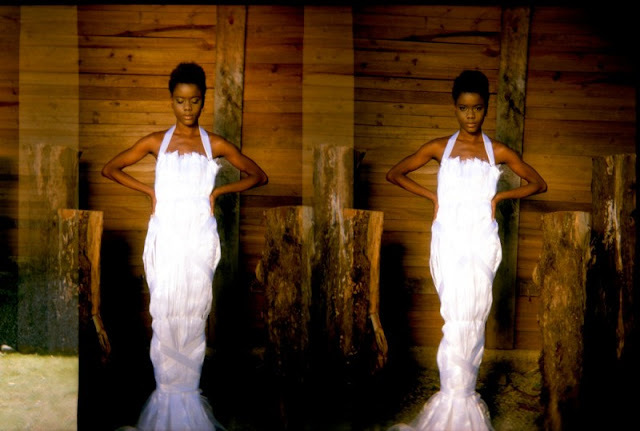 Model Natasha Fleming is wearing dresses designed by Angela Hurtado Pimentel. Make-up and hair by Alfredo Montoya. "Clothes can become one of our closest possessions, both in the literal and the figurative sense. Clothing embraces and defines us, it helps us to communicate without uttering a word, but it can also limit and restrict our movements and our roles in society. This double-sided approach to the meaning of fashion drove the creation of these three artistic dresses. The leitmotiv was the idea of overflowing: fashion can become a rigid mold that sets boundaries for behavior, but people cannot be contained entirely in any of these molds and they simply spill out. The restrictive silhouettes in these dresses are won over by this overflowing of textures and volume, a representation of our inability to conform. These dresses aim to discover that the fashion system can be subverted to create meaningful and carefully handcrafted pieces, as unique and unrepeated as the people who may wear them."